The Louisiana Restaurant Association's recent A La Carte magazine featured four Q & A style articles designed to provoke, and perhaps inspire restaurateurs, to consider their own meal choices and what they offer on their menus for their health conscious patrons. The National Restaurant Association launched Kids LiveWell last July and has seen an outstanding number--96 to date representing 15,000 locations--of restaurants sign on and commit to offering parents and children more healthful options and information so they can make choices that are right for their families. 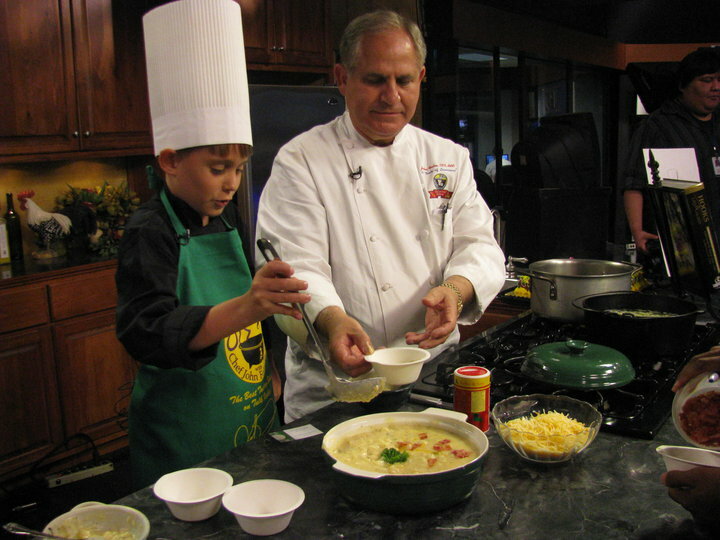 Twelve-year-old Michael Prados launched his blog, jrfoodcritic.blogspot.com, three years ago. It features his dining adventures, both in restaurants and at home, and has garnered attention from local Baton Rouge media and delivered some 57,000 visitors to his site. Chef John Folse in 2011. Prados shared what's important to him and how he balances his dining out with his desire to be healthy. ALC: What are your goals as Jr. Food Critic? JFC: I love food and consider myself a foodie. I love to cook and to eat out in restaurants across the state with my parents. The site allows me to share the meals and experiences with others. ALC: What are some of your preferred healthy items? JFC: At each meal, my family includes a meat, a starch and vegetables. I really enjoy broccoli and asparagus, as well as spinach salads. At school, we have a salad bar so I try to eat salad often. ALC: When you dine out in restaurants, are you conscious of ordering healthy menu items? JFC: Yes, I try to consider the healthy aspect of what I order. However, I don’t eat out but once or twice a week, so I do splurge on some things that don’t fall in the healthy category. ALC: Do you think that restaurants do a good job offering healthy menu options? JFC: Yes, I do. It really just depends on what someone orders, but restaurants do offer healthy options. ALC: What else do you do to live a healthy life? JFC: I work out three days a week with my dad at 4:30 a.m. Because he’s so busy with his job and I’m busy with school, getting up early and getting our work out in is important and something we do together. I’m looking forward to going to camp this summer and there’s a big focus on being active and eating healthy. Do you consider the healthfulness of the food you eat? Are you more conscious of your caloric intake now than in previous years? Does your age factor into what you consume? The post is really interesting. It is nice to hear that one more new blog was launched. Love reading about food. Thanks! Good luck! hey micael its peyton i looked at ur site!